If you live in a tropical climate, a mango tree might be a good addition to your garden. This is a guide about starting a mango tree from a seed. I am growing a mango tree in zone 8, El Paso, TX. Most sites will tell you to start your seed in a ziploc bag and plant it once it has roots. Whenever I did this, my seed died. So I decided to start by just planting it. After eating your mango, scrub the pit gently to make it easier to handle. Gently pry open the pit and pull out the seed inside. Be very careful not to damage the seed. A small nick should be OK. Peel off the paper-like skin and plant your seed. I planted mine about 2 inches deep. Make sure you plant it in a large pot, because you don't want to re-pot it too soon. They are very delicate. Mangoes grow in humid areas. So if you are in the desert, make sure to keep it well watered. I planted 5 seeds, and only 1 grew. Be patient and don't lose hope. My dad also planted a few seeds, and 2 of his are growing. My tree is still small, only about a foot tall but it's still growing and sprouting new leaves. Good luck. I'm trying to grow a mango, but it looks like it's about to die. It begins to have a sprout, but all of a sudden it starts to dry up what should I do? First off, how are you trying to sprout the seed? Normally when I sprout my mango seeds I allow the seed to dry out first. Afterwards, I lay the seed in the dirt. I don't plant the seed, just lay it in the dirt. Water the seed daily to keep the soil wet. 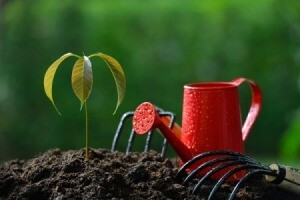 The seed will start to sprout and the roots will start to dig into the soil. Leave the seed in the pot for 3 months before transplanting. Question: How Do I Grow a Mango From Seed? I would like to know how to grow a mango from a seed. Use a fresh seed and very carefully remove and discard the hairy covering. It should be planted on edge with the hump side up, and with from 1/4 to 1/2 of the seed exposed. Keep the soil damp and try to keep it as close to 80 degrees as possible so it will germinate better. If you don't keep it warm enough, the seed will mold. It should germinate in about a week.